A sequence is an arrangements of numbers in a definite order according to some rule. We often come across numbers that follow a particular pattern. In Mathematics,patterns play an important role.To understand more about patterns let us consider a very simple example.As we walk up or down stairs, we some times count the steps unconsciously. Here we ever thought of how much high each step is? suppose the rise is 12 cm and if we are to make a record of the heights above the floor of the steps taken in order, we would get 12 cm,24 cm, 36 cm,48 cm,60 cm and so on. In the first arrangements we can define the pattern is in the form squares of natural numbers,in the second pattern the numbers are in the form of even numbers or multiples of 2.And the third pattern the numbers are in the form of odd numbers. 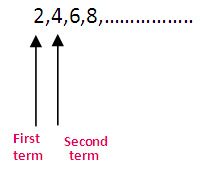 Here the subscripts denote the position of the terms.In the above sequence 1 is called the first term ,4 is known as second term,9 is known as third term and so on. A number pattern which has finite number of terms is called finite seq-uences.It has last term. A pattern which has a infinite(unknown) number of terms is called the infinite seq-uences.In this pattern we don't know the last term. From the following example we can understand how to find required term of the pattern.